The new face of Google AdWords has finally arrived within some accounts at Anicca, well in the form of an Alpha anyway. This means it’s likely that it is in an early stage in the process and Google wants to test the new interface, so this could be subject to change. I’ve dived straight in to discover any major changes and to check out the new look. My first impression is how clean the interface is, there are a lot more visuals compared to the previous view. 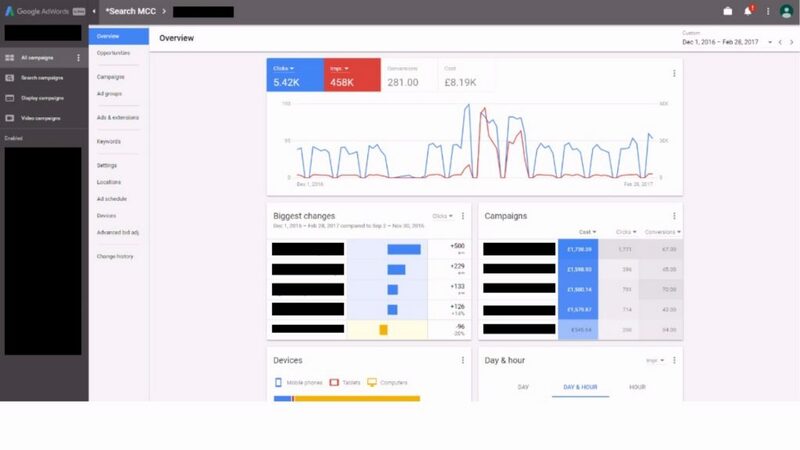 Another thought that instantly sprung to mind is how the style fits seamlessly with the new views we have been seeing across Merchant Centre and Google Analytics creating a consistent experience across all platforms. Visuals are the most noticeable and impactful change. They dominate every overview and provide great visual representations of data. AdWords can now be used in more versatile ways, with the data much easier to digest. The example below is taken from the location targeting section, where you are now greeted with a map and your data below. Navigation changes provide a new challenge for AdWords users, with a fairly large overhaul in structure. However the new navigation is much smoother than previously, and from first tests quicker too! I’m sure that once people get familiar with the navigation it will prove much more functional than its current state. Dimensions is one of the main features not to be included in the current Alpha. 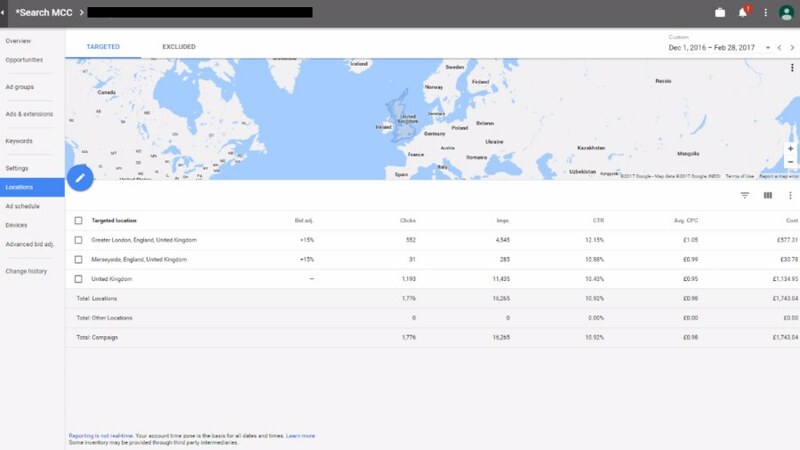 Many found dimensions to be one of the most useful features in AdWords, with the various outputs and segmentation’s of data that it provided. Don’t lose hope however, this is only the Alpha, it is likely that there will be more changes made. Price extensions are another feature that don’t appear within the new version. With price extensions only recently being rolled out to desktop, we expect these to make an appearance as Google works through the role out. Message extensions are another ad extension not to be featured. Shared Library is another key feature we are yet to find within the interface, with audiences, shared budgets and business data all located under it we expect this will be coming as updates are made during the Alpha and Beta roll-outs. Goals is a feature that allows you to set the goal for each campaign within the settings tab; Google will then provide suggestions to help improve your campaign performance based on this goal. Advanced bid adjustments is a feature added on the end of the optimisation selections, which allows you to apply bid adjustments based on interactions with ads. Overall, I believe that this is a step forward for AdWords. The fluid navigation may take some getting used to, but it’s necessary and works well. Some of the missing features we are hoping to see get re-instated in later versions, as they are key to some account successes. The highlight for me is the new visuals, I think they add a great new modernized look to the interface and will prove more engaging for users. If you require any assistance or consultation with your AdWords campaigns get in touch with us on 0116 298 7496 or take a look at our training courses online.